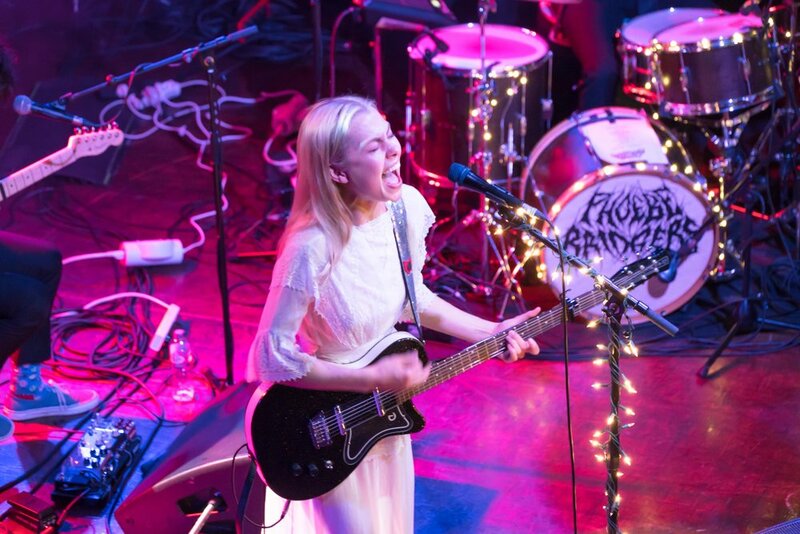 Tonight, London’s Scala opened its doors and watched as the crowds huddled in to witness a tender and haunting spectacle orchestrated by none other than Californian folk-rock artist Phoebe Bridgers. Wearing a white dress, while her band members stood in sharply pressed suits and dishevelled looking ties wrapped loosely around necks. It was like a prom night for the dejected, a melancholic celebration for the pensive while swaying along to summer bummers from Phoebe’s stellar debut album Stranger in the Alps. Tracks such as Funeral and Demi Moore exhibit Phoebe’s tender and evocative lyricism with the utmost delicate precision. Both her and her band members vocals floated like fragile little ghosts as they hunched over a single mic while singing a cover of Gillian Welsh’s Everything is Free leaving everyone utterly mesmerised. Bridgers offered wry little moments between her and the audience as she announces that tonight is going to be the last show in a while and “a bit melancholy, not that it isn’t usually”. Meanwhile projected on screen is a live illustration by sketch artist Chris Riddell as he masterfully illustrates a visual interpretation of each song, offering the perfect accompaniment between lyricist and artist, sharing intricate little moments for the crowd to enjoy. Bridgers ended by announcing her new collaborative project between her and artists Julien Baker and Lucy Dacus under the name boygenius, before playing a track Me & My Dog taken from their upcoming EP. It was a truly moving performance from Bridgers as she quietly commanded her audience and showed that small intimate moments really can be the most beautiful.